Insofar as sharing-economy firms provide innovative and efficient ways to implement and manage those nontraditional arrangements, they are promoting economic inclusion for workers who now find fewer opportunities in the traditional labor market. Are we becoming a nation of freelancers? Some fear that traditional employment is ending, a phenomenon perhaps driven by the rise of the sharing economy. Others have raised doubts that any changes are afoot in the labor market. We report on new data received from the Internal Revenue Service that sheds light on the changes in independent contracting. 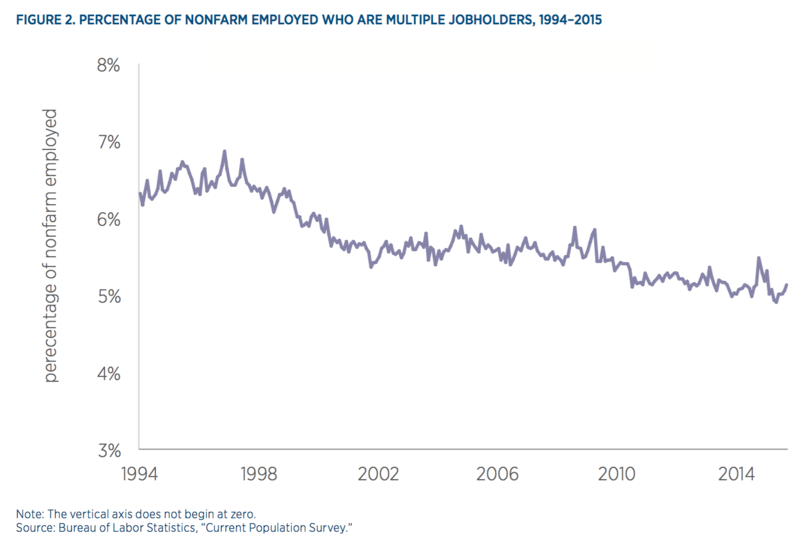 Our data support the claim that there has been an increase in nontraditional employment, but the data refute the idea that this increase is caused by the sharing-economy firms that have arisen since 2008. Instead, we view the rise of sharing-economy firms as a response to a stagnant traditional labor sector and a product of the growing independent workforce. Studies based on surveys offer conflicting conclusions about what is happening in the labor market. 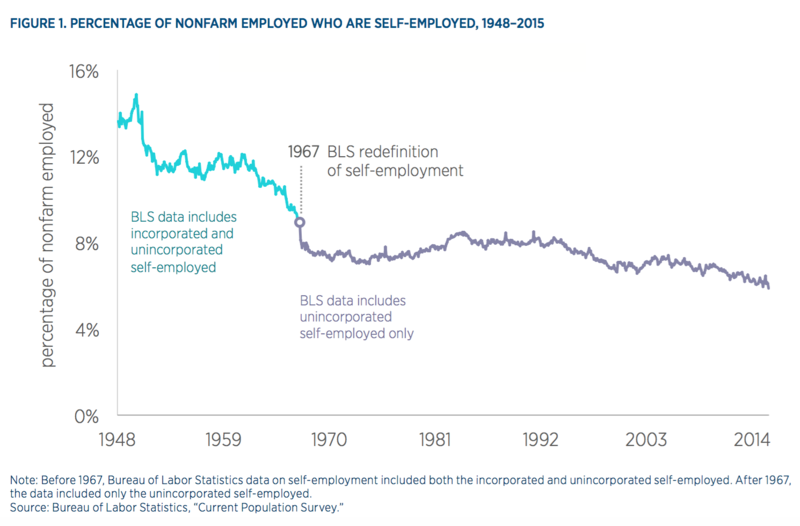 For example, Adam Ozimek uses data from the Bureau of Labor Statistics’ Current Population Survey to show that self-reported self-employment is at a 70-year low (shown in figure 1) and that the percentage of workers who report holding multiple jobs has declined over the last two decades (shown in figure 2). On the other hand, Will Rinehart and Ben Gitis, using data from the General Social Survey, estimate that freelancing accounts for nearly a third of all jobs added from 2010 to 2014. Both of these studies attempt to answer the same question. Both have data to support their findings. However, they reach dramatically different conclusions. These differences may be a product of the choice to use survey data to measure employment. A weakness in using survey data to explore the changing nature of work is that survey answers can change along with respondents’ understanding of the nature of work. Do full-time Uber drivers understand themselves to be “self-employed” or employed by Uber? It is plausible that they might answer either way. Is being an Airbnb host “working a second job?” It is unlikely that the hosts themselves see it that way. Survey answers may be colored by how respondents understand their respective situations. Moreover, given the current debates surrounding the status of workers using sharing-economy platforms, responses may be aspirational as much as they are descriptive of reality. A worker may describe herself as “employed” not because she is in fact an employee, but because she believes she ought to be considered one. To better understand the changes afoot in the nature of work, it is important to find more objective measures. In figures 3 and 4, we report new data that we received following an inquiry to the Internal Revenue Service on tax forms reported through Publication 6961 going back 20 years. In particular, we received total counts of the number of W-2 forms and 1099-MISC forms issued by the IRS since 1994. This data may also be accessed in table 1 at the end of the paper. W-2 and 1099-MISC forms can help to illuminate the changing nature of work. W-2 forms provide a measure of activity within the traditional employment relationship. They are issued by the IRS for salaries and wages reported by employers for each employee. For individuals working multiple jobs, multiple W-2 forms are issued. Among the 17 classifications of 1099 forms issued by the IRS, the 1099-MISC is the best measure for the growth in independent work. 1099-MISCs include reported income for individuals who have received between $600 and $20,000 outside the traditional employment relationship. This also includes individuals who have taken part in fewer than 200 transactions with a single entity or within a particular platform. In the context of the sharing economy, 1099-MISC forms are issued for income reported by firms for each individual. As a result, individuals working through multiple platforms like Uber, Lyft, Airbnb, TaskRabbit, and Instacart will receive multiple 1099-MISC forms. These new data show that changes in the labor market are indeed underway. They also place some important parameters on our interpretation of those changes and provide greater context for understanding the causes of the growth of the 1099 workforce. 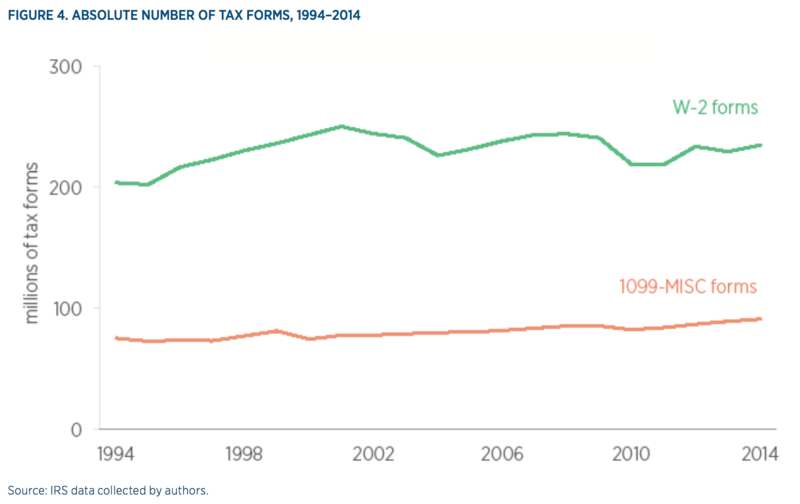 First and most importantly, as shown in the indexed number of tax forms in figure 3, there has been a significant increase in the total number of 1099-MISC forms issued by the IRS in the last 15 years, around a 22 percent increase since 2000. During the same period, W-2 forms have stagnated, falling by around 3.5 percent. Nevertheless, it is important to keep in mind that in absolute terms, 1099-MISCs are still dwarfed by W-2s. 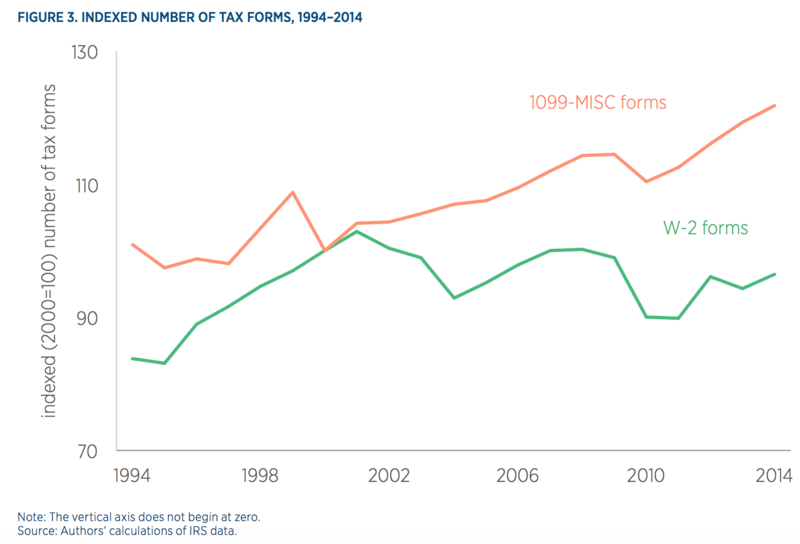 Figure 4 shows the absolute number of W-2s and 1099-MISCs from 1994 to 2015. In 2014, there were about 235 million W-2s issued, and only about 91 million 1099-MISCs. For 1099-MISCs to outnumber W-2s, the linear trend since 2000 would need to continue until 2082. Some have said the rise of the sharing economy is to blame for the recent increases in independent contractors. However, this narrative falls apart when it is held up against the available data. Uber, the largest of the new sharing-economy companies, was founded in 2009, and Airbnb was founded in 2008. Yet the 1099 economy begins to diverge from the W-2 economy nearly a decade earlier, in the first few years after 2000. 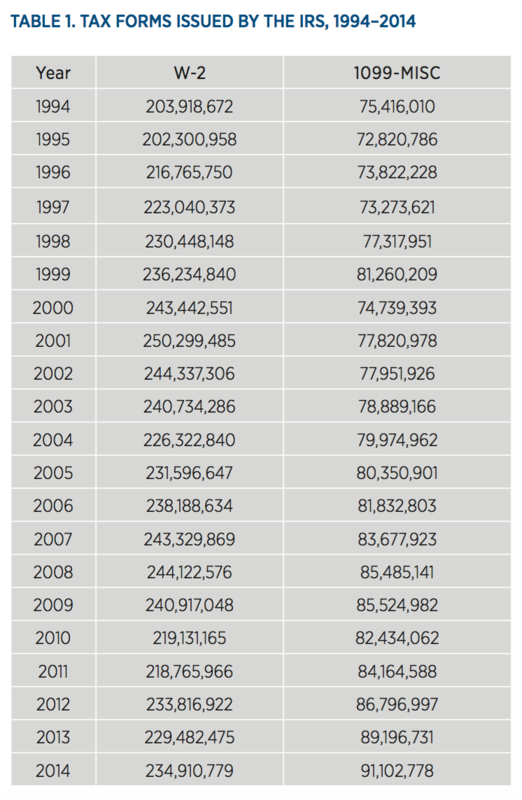 In fact, while the number of W-2s issued in 2008 was nearly equal to the number issued in 2000, the number of 1099-MISCs issued in 2008 increased by nearly 15 percent over those issued in 2000. The sharing economy cannot be blamed for the increase in independent contractors. Instead, given the discrepancy in timing, the rise in the sharing economy should be viewed as a welcome response to more fundamental changes taking place in the labor markets. Using data from the Census Bureau’s Business Dynamics Statistics, Ryan Decker and his coauthors show that measures of traditional labor market dynamism have been falling for decades. 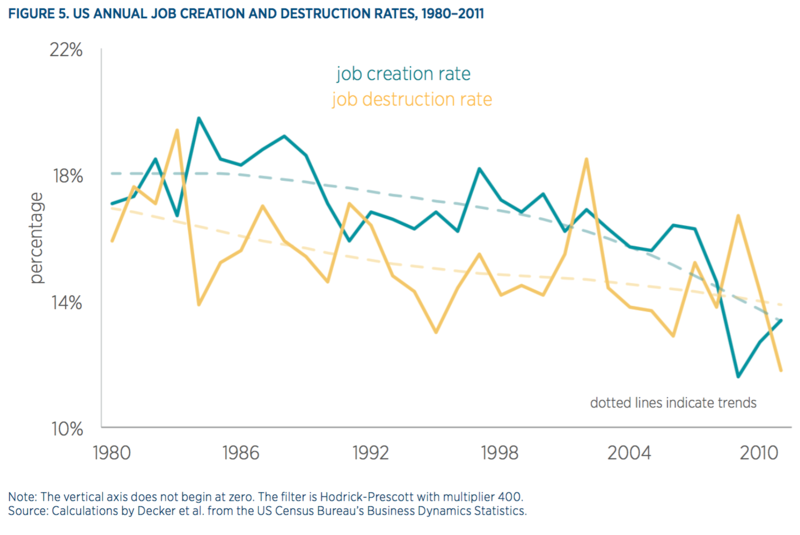 As shown in figure 5, both the job creation rate and the job destruction rate have fallen—the former more steeply than the latter. This falling dynamism, which long predates the rise of the sharing economy, presents new challenges for those seeking traditional employment. The long-term decrease in the rate at which new jobs are being created suggests that traditional employers are becoming more selective when it comes to hiring. The secular weakening in the labor market, indicated by the faster fall in job creation than job destruction, is also bad news for those looking for traditional jobs. The more flexible work arrangements offered by sharing-economy platforms provide an alternative for those excluded from traditional employment relationships. The rise of firms such as Uber, Lyft, TaskRabbit, Instacart, and others should be seen as the product rather than the cause of the growing 1099 workforce. These companies are able to offer employment on these more flexible terms only because there is a willing supply of workers eager to accept them. Without the nontraditional arrangements offered by the sharing economy, workers would be worse off. The shift toward more contract work is a real and dramatic change in the labor market. At the same time, the changes need to be kept in perspective; traditional employment still dominates contract work and will for some time. In addition, it is impossible for the sharing economy to have caused the increase in contracting, as the rise in contracting predated the establishment of the biggest sharing-economy companies. We should view the rise of the sharing economy as a natural consequence of more fundamental changes in the labor market, and should count that as one of the many ways that the sharing economy is creating value. As traditional labor market dynamism wanes, firms and workers have adopted more flexible, nontraditional work arrangements as a response. Insofar as sharing-economy firms provide innovative and efficient ways to implement and manage those nontraditional arrangements, they are promoting economic inclusion for workers who now find fewer opportunities in the traditional labor market.